English composer, Peter Aston, was born in Birmingham in 1938 and studied at Birmingham School of Music and University of York. His career subsequently combined teaching and lecturing whilst working as a composer, conductor and musicologist. He held senior academic posts at the University of York and University of East Anglia, where he taught for twenty five years and is now Professor Emeritus. His compositions include songs, chamber works for voices and instruments, choral and orchestral works and a children’s opera. However he is best known as a composer of church music and was a founder of the Norwich Festival of Contemporary Church Music and was a Lay Canon of Norwich Cathedral. As a conductor he has worked with leading British orchestras and various international choirs. Positions held include conductor of the Aldeburgh Festival Singers and Principal Conductor of the Sacramento Bach Festival Choir and Orchestra in the US. He also founded the Tudor Consort and English Baroque Ensemble. Peter Aston also worked as an editor of Baroque music and has written extensively on music of that period. Peter sadly passed away in September 2013 after suffering with cancer. Dr Sharon Choa, director of UEA music, paid the following tribute: "Prof Peter Aston was appointed professor of Music at UEA in 1974 and served the school and UEA tirelessly until the end of his life. "Only a few weeks ago, he was still making sure that parts of a composition by him were delivered to us safely for UEA's 50th anniversary celebrations. 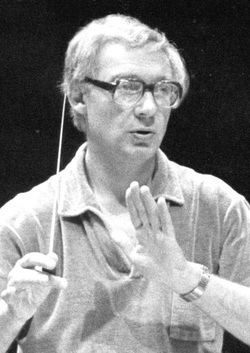 Recognised early in his career as one of the foremost musicians and composers of his generation, he was selected by Benjamin Britten not only to head the School of Music but to direct the Aldeburgh Festival Singers, a position he held for 14 years. "At UEA, his love of teaching earned him much affection from all students. He founded the Friends of UEA Music scheme, rounding up a host of supporters to contribute towards creating scholarships for Performance students, ensuring that such teaching could be kept at a high level despite government cuts. These scholarships are still benefitting our students. "Besides his work for UEA, he founded the Norwich Festival of Contemporary Church Music and became a Lay Canon of Norwich Cathedral. In recent years, he formed the Morley Consort – an ensemble made up of some of the best vocalists in Norwich. Peter is committed and passionate in all his endeavours, including his love of football, chess and bridge. He will always be remembered by us as a very dear colleague and friend."